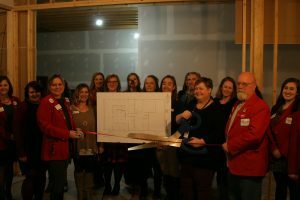 The Sheridan County Chamber of Commerce hosted two ribbon cuttings on Wednesday night. 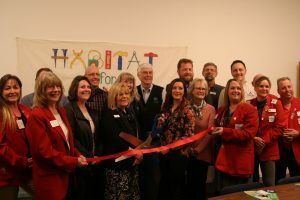 The new Habitat for Humanity offices and the new Compass Center for Families were welcomed in as official members of the Chamber. The event also doubled as the Chamber’s “Business After Hours” event. The ribbon-cutting was followed by a joint open-house at the two offices. Habitat for Humanity is an organization that helps families in need build affordable housing and also partners with families to help them repay a mortgage through Habitat with an affordable payment plan. Compass Center for Families is an organization that addresses the need to raise community awareness and involvement in the issue of child abuse and neglect. Both offices are located at 1981 Double Eagle Drive in Sheridan.